Our selection of safety glasses over prescription glasses come in a variety of styles to better fit over today's prescription eyewear. 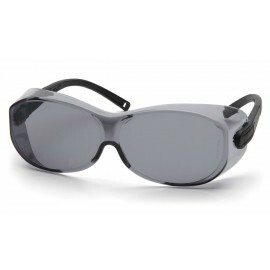 A great choice and cost saving alternative to prescription safety glasses. 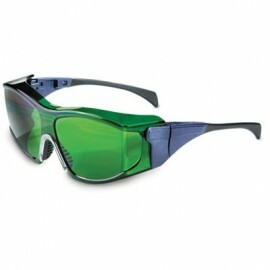 All glass safety glasses meet ANSI Z87.1 standards. ANSI Z87.1 is a standard for criteria and testing standards for eye protection products & equipment. Make sure your's meet this requirement. Wearing safety glasses over prescription glasses has many benefits. 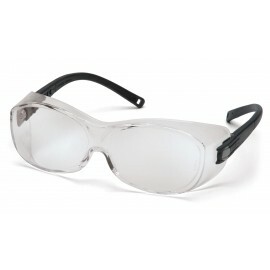 Whereas pair of prescription safety glasses can be costly, over glasses fit right over the top of your regular glasses. Over glasses are durable and will protect the glasses underneath. You do not need to worry about damaging your prescription glasses. Over glasses can be worn indoors or outdoors, at a construction yard or in your garage. You will wonder why you haven't purchased a pair yet. It's important when choosing safety glasses that will fit over your standard glasses, that you choose a pair large enough to full cover the lenses of your standard glasses that you will be wearing. The purpose of these types of safety glasses is to protect not only your eyes, but to prevent objects from hitting your standard glasses, which could result in spalling, or fragments of plastic or glass. Why wear over the glass styles? 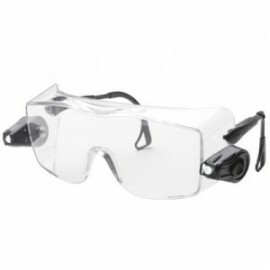 Wearing over the glass styles of safety glasses is a economical alternative to having custom designed safety glasses produced for your staff, employee's or yourself. When prescriptions change, no change of safety glass product is required. Where as with custom prescription safety glasses, the old set will be thrown out (as no one else will likely have the same prescription), and a new set, at great expense and time, will have to be secured. 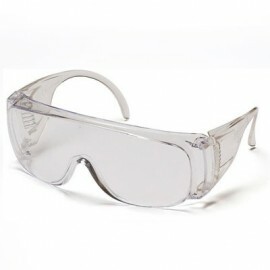 Additionally, expensive prescription lenses can be protected over the glass safety glasses. This means that if the safety glass lense is scratched, it is a small expense, rather than a large expense of time and money in replacing custom prescription lenses. Safety glasses can and do degrade. Most safety glasses are made of some type of plastic/polycarbonate material, and when exposed to the environment, can degrade in strength over time. 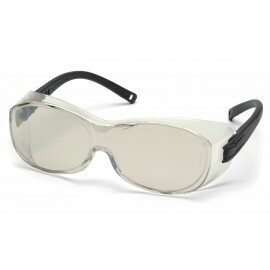 Additionally, as safety glasses are designed to protect, they are often exposed to harsh environments, and should be replaced if they exhibit hazing, scratches, dents, cracks, pitting, or changes in the materials hardness/brittleness. Additionally, if they are exposed to solvents, chemicals or other products they were not designed for, they should be replaced as well. Quite simply, protecting your vision is not worth gambling over the small investment a new pair of glasses represents. Q: Will over glasses fit over my rather large pair of prescription glasses? 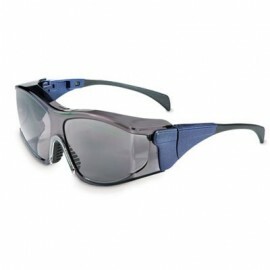 A: We sell a wide range of safety glasses from different manufacturers. Some come in different sizes, while other are already made in larger sizes. 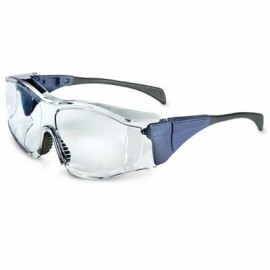 We carry a pair of safety glasses that will fit you. Q: How do I know if my over glasses are rated for UV safety? 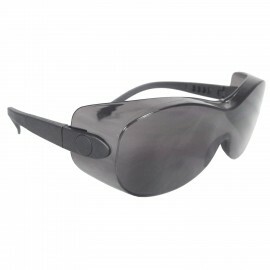 A: All of our over glasses safety glasses block 99.9% of UV rays. You will find a symbol indicating a UV protection rating on the side of the glasses. 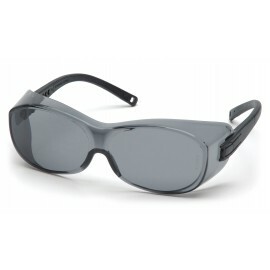 Q: Are over glasses as tough and resistant to debris as standard safety glasses? A: All our safety glasses pass the same ANSI Z87+ high impact standards as regular glasses. They can be worn for work in most applications that pass those criteria.